Notts County Supporters Trust has formally completed its share purchase of the football club. 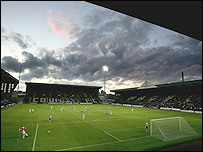 The Supporters Trust now owns 60% of the club's shares which effectively gives it control at Meadow Lane. Chairman of the trust, Keri Usherwood, said it was an important day for taking the club forward. The Supporters Trust bought shares from shareholder Hayden Green who loaned them the money for the purchase on "very favourable terms". Mr Usherwood said fears over financial difficulties for the club were not an issue. "The trust has put in over £300,000 to Notts County Football Club to date and the agreement we have with Hayden Green is on very beneficial terms for us," he said. "We now need to start looking forward as to how we're going to support Notts County, the oldest professional league club in the world. "I hope people will see what we've done and be somehow inspired by that." The Magpies are currently eighth in League Two.